GERMAN POLICE HAVE warned social media stars to rein in their followers after making several arrests during a brawl in Berlin when fans of two YouTubers squared off. Berlin police said they made nine arrests last night after a fight broke out in Alexanderplatz in the city centre among some 400 backers of two rival stars of the internet platform. One of the YouTube stars involved, Berlin-based Bahar Al Amood, who has 13,000 subscribers, later apologised on his Instagram account, before rejecting any contact with the media. “I’m traumatised and feel afraid to go out. I want to be with my family,” the 18-year-old YouTube star told Berliner Morgenpost daily. The teenager accused his YouTube rival of going on his “live stream and insulting me”. Having been accompanied by five friends to meet Al Amood, ‘ThatsBekir_’ claims he was punched by his rival in the face and things quickly became ugly. “He asked me why I had called him a ‘son of a whore’, that’s how things started,” said the teenager. Videos of the meeting posted online appear to show the pair talking face-to-face, surrounded by their supporters, and after a brief conversation, punches started to fly. ‘ThatsBekir_’ believes his rival from Berlin wanted attention from the internet – “he wants fame and subscribers – nothing more,” added the 18-year-old. 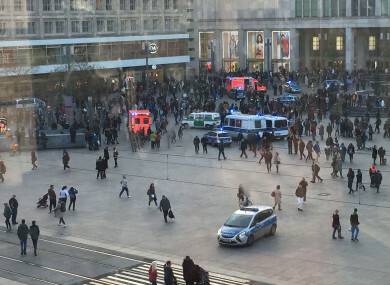 Email “Berlin police break up mass brawl organised by two rival YouTube stars ”. Feedback on “Berlin police break up mass brawl organised by two rival YouTube stars ”.